The quality of a performance does not drive the amount of applause an audience gives, a study suggests. Instead scientists have found that clapping is contagious, and the length of an ovation is influenced by how other members of the crowd behave. They say it takes a few people to start clapping for applause to spread through a group, and then just one or two individuals to stop for it to die out. The Swedish study is published in the Journal of the Royal Society Interface. Lead author Dr Richard Mann, from the University of Uppsala, said: "You can get quite different lengths of applause - even if you have the same quality of performance. This is purely coming form the dynamics of the people in the crowd." The research was carried out by studying video footage of groups of undergraduates as they watched a presentation. The scientists found that it took just one or two people to put their hands together for a ripple of applause to spread through the crowd. These claps sparked a chain reaction, where, spurred on by the noise, other audience members joined in. "The pressure comes from the volume of clapping in the room rather than what your neighbour sitting next to you is doing," explained Dr Mann. But the performance that had been witnessed - no matter how brilliant - had little effect on the duration of the noisy acclaim. In fact, the researchers found the duration of applause varied greatly. Dr Mann told BBC News: "In one case an audience might clap on average 10 times per person. Another time they might clap three times as long. "And all that comes from is that you have this social pressure to start (clapping), but once you've started there's an equally strong social pressure not to stop, until someone initiates that stopping." 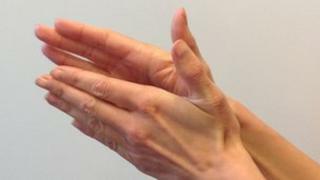 The scientists believe that clapping is a form of "social contagion", which reveals how how ideas and actions gain and lose momentum. Studying this, they say, could shed light on other areas, such as how trends come in and go out of fashion or how ideas spread on the internet. Dr Mann said: "Here we tested whether you are more driven by the total number of people in the room or the people sitting next to you. "And the equivalent on Facebook or Twitter would be whether you are more likely to join in a trend if you see lots of people in the wider world mentioning it or if just your closer friends mention it." A respectful round of... applause?